I decided that this year I would make my own journal and would mostly record my Word of the Year in it with a calendar for each month. I gathered together lots of scrapbooking papers and cut them to size. I used Mary Brack's Signature Journal class as a starting point. I put them together in groups of 4 folded full size pages and some extra pages. I sewed each set together as signatures. I was going to leave them like that work through the signatures as I needed them. But I know me and I am easily put off - I gave up on this years word and journal - so thought it might be better to make the complete journal. I thread some sticky sided fabric tape through 2 of the stitches and put two pieces over the top to hold the 5 signatures together. I cut 2 pieces of card which happened to be red on one side. I used double-sided tape and gluestick to attach the card to the page of the first and last signature. It didn't really stick very well so I put the tape again to hold it all together. Here you can see a bit of the inside of the journal. Once I know what my word of the year is, I will make an appropriate cover for the journal. Join Mary Brack, Valerie Sjodin and I in our Facebook group where we are giving participants the opportunity to live out an A-Z of their own word throughout 2019. We don't like a lot of rules, so we will have suggestions and options to spark creativity, and to help in recording and exploring our word’s meaning in visual and fun ways. We will each blog about our experiences and our art. Thank you to all of you who have followed along with me on my creative journey throughout 2018. I have started trying out if things work before I actually make the samples for my Master Practitioner project. I found some Tyvek that was left over from a previous project and using the instructions in Lynda Monk's book: beautiful bonded surfaces, I had a go with Tyvek and bubblewrap. This thick piece of Tyvek was already painted gold on one side and turquoise on the other. Here's what happened when I ironed it. I ironed Bondaweb onto the felt and put some wool tops on top. I put the Tyvek on the top and ironed. Then realised I had forgotten the bubblewrap! Back to the thicker Tyvek and including wool tops this time. This time I forgot the first layer of Bondaweb but actually it didn't matter. The result when I had ironed it. I was hoping the wool tops would show through the Tyvek more. And lastly the same sandwich again but with the first layer of Bondaweb on the felt. Here they are together. I like all of the results but I think it will be impossible to sew through the thick Tyvek especially with how little strength I currently have in my right hand. I need to try the thin Tyvek with the bubblewrap as I rather like the 'veins' that the Tyvek revealed. More Tyvek has been ordered and more play time will happen once it arrives. Recently I asked Clare Bullock if she would do a Nuno Felting workshop for a group of my friends. And she said YES! Whooppeeeeee! So four of us travelled to her fabulous studio in Sharnbrook, near Bedford. Clare started by showing us her technique for Nuno Felting. Then we all had a go. This is the first sample I made. I made two other pieces in the same way during the morning. After lunch we made a white on white piece. I added purple, pink and Quink blue ink and the colours did their thing. (see the piece on the right). I had a lovely day. Clare is such a brilliant and generous teacher. You could have fun too. Keep checking out Clare's website and if you can't see a suitable date for you, why not contact Clare and set up a workshop with her. Last time I showed you the small collages I made using gel plate monoprints. I tried them out in small concertina book. As I mentioned I now need to decide what to make. 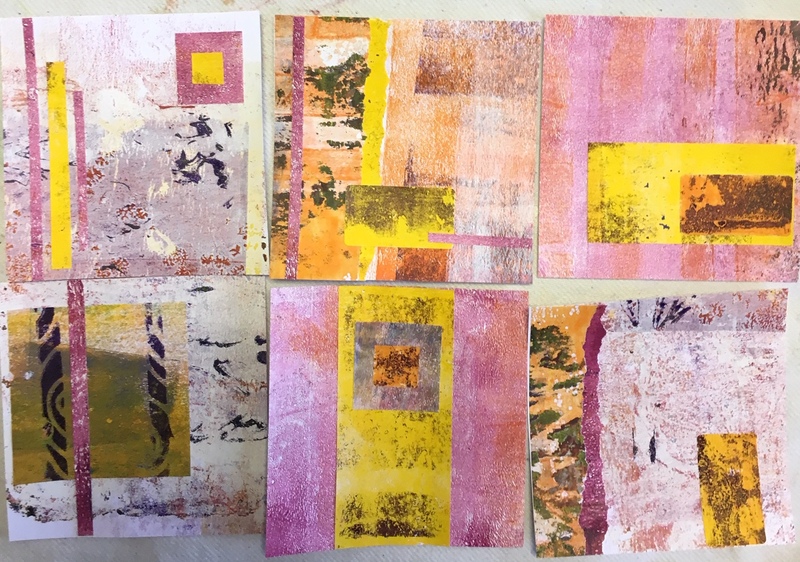 This is still being percolated in my brain but in the meantime I thought I would dye some fabric with procion dye using the colours in the monoprints as inspiration. I put equal amounts of old linen, cotton poplin, silk, silk viscose rib and scrim in two trays. I used Magenta, Merlot, Dark Blue and Charcoal Procion dyes. In this tray I used Golden Yellow, a Scarlet & Lemon mix and some Charcoal. Dry and ready for use. Now to concentrate on what to make and then to make 12 samples. It's all go here! If you have read the previous two posts you will know that I am working on a project inspire by a poem and a piece of music. It was so difficult to settle on one piece of music but in the end I chose 'Summertime' by George Gershwin from the opera Porgy & Bess. I decide to make marks whilst listening to the music. I used several colours of yellow paint and different sized brushes on a big piece of lining paper. I put a section of the painting to music paper in my sketchbook. I added a photo of one of my gelli prints and the words of Summertime. I also put a piece of fabric with the words printed on with a Thermofax screen. I put two of the gel plate print photos on a page and used the screen again. And collaged photos of gel prints and the painting. I moved on to painting papers but forgot to take photos until I had cut it up and collaged it with washi tape lines. I rather like the purple and magenta with the yellow and orange. I need to decide now what piece of work I am going to make from all this inspiration.